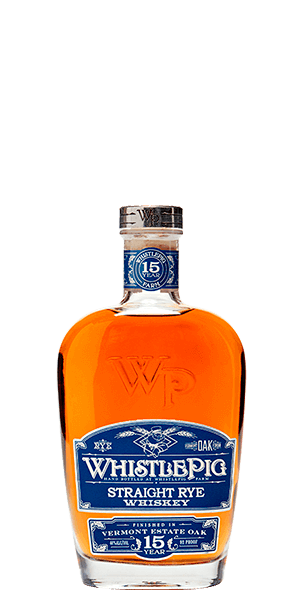 WhistlePig 15 is a creamy, super-flavorful example of Rye American Rye know-how. WhistlePig began in 2017 when a band of dedicated Rye enthusiasts transforms an old dairy farm in Vermont in to a Whiskey-making paradise. They teamed up with master distiller Dave Pickerell — formerly of Maker’s Mark — to bring genuine Rye Whiskey back to the forefront of American Whiskies. It took a lot of time, patience, experimentation, and reinvestment, but they have grown to produce five award-winning core products and have experimented with a variety of finished wood special edition Whiskeys too. WhistlePig 15YO is the oldest spirit made by Whistle Pig so far. In a word, it’s delightful. Seriously … even the reviewers at Forbes said exactly that. If you need more convincing, Wine Enthusiast gave it 97 points — and when wine drinkers give you a score like that it’s saying something. And this exceptional Rye Whiskey celebrates its quinceañera (fifteenth year) in native, estate-grown Vermont Oak and is bottled at a spot-on perfect 46% ABV. Why do they use Vermont Oak? Well, not only is it a local wood growing natively on the Whistle Pig Estate, but it has tighter, slower-growing rings that they believe imparts more flavor per barrel. What does WhistlePig 15 Year Old Straight Rye Whiskey taste like? The Flavor Spiral™ shows the most common flavors that you'll taste in WhistlePig 15 Year Old Straight Rye Whiskey and gives you a chance to have a taste of it before actually tasting it. The aroma is thick on the nose with rich vanilla caramels, exotic spices, and brûléed oranges. Rich and creamy on the palate, it powers in with butterscotch, baking spices, and warm leather. The finish is warm and long with lingering sweetness and bite. I love it, smooth tried it for the first time in Vegas and after that it was a must have at home! An excellent Rye, smooth and flavorful! Great for relaxing after a long days work! I am not a Rye Whiskey drinker, but I did find this bottle quite good. It was very smooth, and I would definitely share with other Whiskey lovers.